Shepard wanted! This flock of sheep is looking for someone to take care of them. Who could resist these trusting eyes? 1 pc. 8,06 EUR ea. 1 pc. 17,59 EUR ea. The tiny and cute sheep will take your heart by storm. Only when you look closer you'll see the embedded disc magnet, which makes each of them very useful on your magnetic board. Counting sheep has never been so easy! This flock of sheep is attracted to ferromagnetic surfaces, so they won't take off on you. The team of six sheep is waiting to be used. Thanks to the appealing packaging, the sheep make great gifts, although you'll probably not want to give them away anymore! The sheep look innocent and soft, but they are stronger than you think. 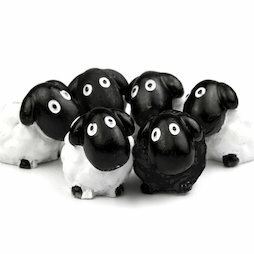 An individual cute little magnetic sheep can hold up to 8 DIN-A4 sheets of paper.